Giving rise to or producing a deteriorated human or their offspring: The medical doctor was researching the factors that caused the cacogenic condition of his patient." The study of racial degeneration: Cacogenics, also known as dysgenics, is the study of elements that result in the perpetuation of defective genes and characteristics of the offspring of a particular population of people or a species of animals. An unpleasant or bad taste in the mouth which is a frequent complaint with idiopathic epilepsy when patients are receiving tranquilizer therapy and resulting in some somatic delusional conditions: Cacogeusia is not caused by food, drugs, or other material; but, it is usually a part of a sensation experienced at the beginning of a seizure or of psychomotor epilepsy. 1. Bad writing or bad handwriting; opposed to calligraphy: Olive has always been told that her cacography was astonishing and that she was the only one could read it. 2. Incorrect spelling; a bad system of spelling; such as, that of current English; an antonym of orthography: Carol noticed a lot of cacography in the newspaper and so she wrote a letter to the editor suggesting that he should hire a proofreader. © ALL rights are reserved. 1. A dread of consuming bad water or of being contaminated or infected in some way by it: Because of her cacohydrophobia, Evelyn always carried a bottle of juice with her in order to avoid drinking the impure liquid from a public fountain. 2. An abnormal fear of being exposed to water from the cloaca or waste pipes: Even though she enjoyed the walking tours of the large and ancient city, Lois would not go on the historical sewer walk because of her cacohydrophobia of the polluted liquid that was still there. The involuntary use of vulgar or obscene words, as seen in some schizophrenics: During the students' tour of the medical ward, the doctor pointed out a patient that suffered with cacolalia and who was sitting quietly while muttering indecent and offensive words, apparently not realizing what he was saying. Bad speaking or pronunciation; socially unacceptable diction: Hester worked with a speech pathologist for many years to overcome her cacology so she could feel more comfortable when speaking in public. Although Edgar's speech and language were acceptable in the isolated hill community where he grew up, his cacology caused him a lot of embarrassment when he went away to college. Congenital deformity of one or more arms or legs: Dr. Jonas, the orthopedic surgeon, reassured Janice that the cacomelia of her legs could be corrected by surgery and physiotherapy. A bad form or shape: Due to a poor diet, Ted's son developed a cacomorphosis of his legs making them appear to be bowed and not straight; as, they usually are with normal physical development. 1. 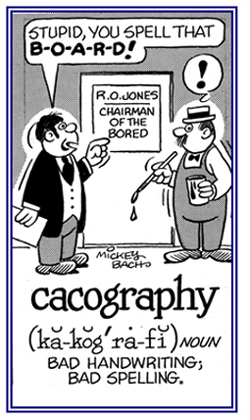 An example of bad nomenclature or terminology; especially, in biology and botany: When the editor had the new botany text proofread, she discovered many examples of caconyms which had to be corrected before publication. 2. A name, especially a taxonomic name, that is considered linguistically undesirable or bad: When correcting Tomas' essay on biological terms, the instructor was amused by some of the caconyms which he used and which needed to be corrected because they were not relevant to the context of the subject. A Hippocratic designation for a severe mental disorder: The ancient medical teacher, Hippocrates, often described mysterious maladies as a cacopathia; especially, when the patient seemed to be mentally disoriented. An old term for a severe affliction or malady: Deeply puzzled by the cacopathy of the patient, the elderly and wise country doctor urged her to get lots of rest, drink only boiled water that has cooled, and to only eat fresh fruits and vegetables. Inter-related cross references, directly or indirectly, involving word units meaning "bad, wrong": dys-; mal-; mis-; pessim-; sceler-.